Feminine and flirty, this short tulle homecoming dress in rose gold pink is a delightful style for a variety of semi-formal events. Sparkling sequins, in a swirling design, adorn the v-neck bodice, while gathered layers of tulle create the short skirt on the little party dress. 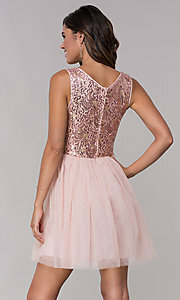 Priced under $100, this pink homecoming dress is budget-friendly and versatile. Ideal for showcasing your girly side at hoco 2019, a family celebration, and so much more, this semi-formal tulle party dress with sequins is a welcome addition to any fashionista's wardrobe.